With HFSECURITY Biometric Mobile SolutionsI(usb/bluetooth fingerprint scanner, Android fingerprint handheld tablet), supermarkets or shopping malls are able to provide mobile payment service with biometric identity for customers. A restaurant owner asked me how to find an employee work in this way. 1. Recognized every old customer. Remember every new client and their order preference. 2. Record down menu within 3 seconds. 3. Working for 24 hours /7 days. No sleep. The rate of correct is 100%. Me: All you need is FP09. 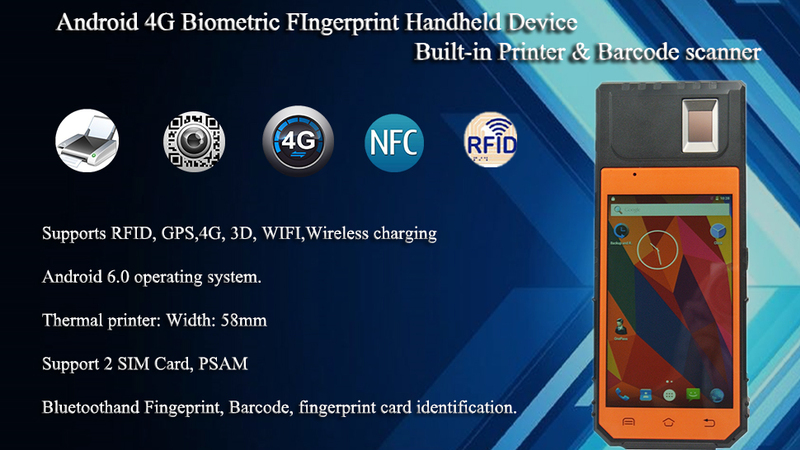 FP09 is HF Security 2017 NEW Patent design, Android fingerprint handheld terminal with Built-in Printer. Androidversion is 6.0 NEWEST and Stable. 2 SIM Card slot to be sure fully have network, no matter in which Telecom Coverage Area. All kinds of Barcode Scanner format support Standard function, include PDF417, details see below. Wireless charge Convenient to operate while charging. 508DPI largest capacitance fingerprint sensor, suitable for both enrollment and verification.